From Grape Stomper marijuana buds anomalous dark purple colored tint scattered with glistening crystals to it's unusually dense texture, sweet scent and sativa strain high, Grape Stomper strain medical marijuana is one of the more unique strains of medical marijuana that you'll come across in Colorado medical marijuana dispensaries. Grape Stomper is a Sativa dominant hybrid marijuana strain. Like all medical marijuana strains, Grape Stomper will effect each person differently. 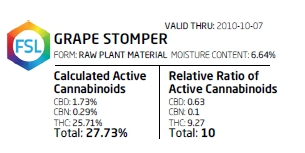 However, like most sativa dominant medicinal marijuana strains, the effects of Grape Stomper are See the Genetics section below for information about Grape Stomper strain lineage and genetics. Grape Stomper is an extremely potent medical marijuana sativa strain variety. When properly cultivated, Grape Stomper strain marijuana can reach a THC content of as high as 25%. To get a perspective of how potent this strain is, most top-shelf medical marijuana stains that are considered to be potent contain a THC level of 13% to 17%. Grape Stomper strain buds have a very unusual appearance in comparison to most cannabis strains available at Colorado medical marijuana dispensaries or cannabis clinics. Even the dark purple tone characteristic of the Granddaddy Purple medical marijuana strain hardly rivals that of Grape Stomper strain marijuana buds. The sparkling crystals against Grape Stomper buds dark green and purple color add to the medical marijuana strains mystic appearance. Grape Stomper strain medical marijuana's appearance is not the only characteristics that separates the strain from most other cannabis strains found at Colorado medical marijuana dispensaries. Grape Stomper buds are one of the densest strains of medical marijuana. Unbroken buds of Grape Stomper medical marijuana have a mildly sweet and fruity scent. Once Grape Stomper cannabis nugs are ground, broken or cut into fine grained greenery, preferably with a quality herb grinder jar in order to retain the maximum amount of THC and other active cannabinoids, a much stronger sweet and fruity-citrus aroma is realized. Grape Stomper is priced like most top-shelf medical marijuana strains: $15 per gram; $50 per 1/8th; $280 per oz. Of course, the price you pay for a particular strain of cannabis will depend on the availability of the strain to Colorado medical marijuana dispensaries and the demand for the strain from MMJ patients at the time. Grape Stomper is a mostly Sativa hybrid cross of the OG Kush marijuana strain, Purple Urkel strain and Chemdog strain. Grape Stomper plants can be grown either indoors or outdoors, using a hydroponic grow system or in soil, starting with Grape Stomper cannabis seeds from a marijuana seed bank or Grape Stomper clones. To harvest a high yield of top quality Grape Stomper medial marijuana it is highly recommended to grow Grape Stomper marijuana plants indoors, using High Pressure Sodium (HPS) lighting. Like many strains of Sativa medical marijuana, Grape Stomper plants can grow to be fairly tall. Flowering time for Grape Stomper medical marijuana usually ranges from 55 to 65 days.